No video for your XBLIG game? Well if you cannot be bothered to do a video for your game, then why should I be bothered to review it ? I do not understand why there are so many games in peer review that do not have Videos, and some do not have all 4 screen shots. That seems ridiculous to me. Is it because you are afraid your game does not hold up? Is it because you cannot be bothered ? Is it because you don't know how ? So lets take those ideas in order shall we ? If it is because your game does not hold up, Guess what. Don't freakin publish it! There is enough crap on the service right now. If it is because you cannot be bothered, then i cannot be bothered to review your game. And if this is a show of your efforts for promoting your game. You are just taking up space on the service as your game probably had the same amount of attention spent on it! If you don't know how to produce a video, I can help ya out there. I am sure Many many other people can as well. If you need help, do a post and i would be glad to answer it. Posted by VoodooChief at 3:28 PM 0 comments No video for your XBLIG game? This is a basic screen grab of the Logo from Mass Medias upcoming PS3Home space. As you can tell we are still working on the space, tnhough it is due to be finished in the next couple of months. Here is some basic info.. It is themed after a carnival midway. We use all the latest technologies to make this place loud and vibrant and entertaining. We have a number of mini-games for people to play, and as a spectator, there is no place better in PS3Home to watch people doing stuff. No more wandering around Zombies that appear to be doing nothing, when in fact they are playing the games. In this space, you actually see them throw the ball, or shoot the hoop etc. I will have more pictures as the days go by, and i will update with important facts or figures, or general gossip about this space. I am the lead programmer on this title, and i am very excited with it. It also gives me a lot of diversity with my own programming on the Xbox360. Here i am, just finished up writing some nice succinct code to setup the firepower fro the player ships with a nice table per level. It is cool. But now i have the firepower upgrades all done, and each level you basically get an upgrade or two to your firepower, i realise i am not sure i wanna do this. 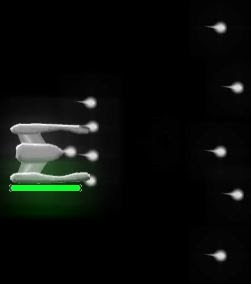 So the idea i had for the game, was every level your firepower gets upgraded. This would be exciting, and i can make the aliens behaviour slightly different for each level and the type of firepower you have. I realise now a few issues though, now i have it working, bah! 1. Hard to balance levels with ever changing firepower. Not impossible, but tbh it would take a lot lot with constantly changing firepower. Not sure i wanna spend that kind of time, when i do not think the general player will really notice the subtelty. 2. Not sure the general player will notice some of the firepower upgrades. Oooh, speed of my primary forward fire has gone up a notch.. Hmm. Maybe not enough of an upgrade to be really noticed. 3. Creating more alines than i would usually have to to combat the firepowers is a big job. If i have say 10 different firepower setups, then i only need to really design 10 aliens setups to counter that,. 25 levels is 25 setups for aliens, yeouch. For a 1 dollar game. No thanks. I am pondering what to do, and all development will be halted until i know what to do. Here are a couple of my ideas currently circulating in my brain. 1. Reduce the number of upgrades to the first 15 levels. The the next 10 levels will have a constant firepower setup and i can concentrate on making them, play around with your skills, knowing the firepower you carry. 2. Give out firepower upgrades every so many levels, say just 4 major upgrades adn they happen every 5th level or so. 3. Make it so the Firepower is Earned.. I have 24 upgrades as is. So i could make it so killing a special powerup wave of aliens would 'Drop' the powerup. This means that if you miss the odd one, the game is harder later. Not nescessarily a bad thing, but something i would have to take into account when designing levels. If you miss too many powerups the game could be impossible. Though that is sort of ok, as you need to get better at the earlier levels. So i am not sure what to do.. I have no clear leanings atm either, so it's a tough one. Now i have permission to post about my Day job, Or half of it anyways. I will be filling this blog up with more stuff. Cos i only do so much each day on my own company's development. That is of course why i only have 3 games out so far. Though the new one is going quite well, it is taking more time than it should to complete. Mainly as i was using the development of this game to form a partnership with a friend of mine. So far i have not been lucky with finding cohorts to work with. They have day jobs and families and lots of excuses. Heck i have excuses too, but i still manage some time each day, though not as much as i would like. On the other hand i view my friendships as much more important than my hobby company that makes no money. So i have really been lucky because after these games co-developments have failed, i have managed to still be great friends with them.. Phew.. I certainly hope that trend continues. Also maybe one day my trend will alter and i will find more people to work with that i can trust. So fara certain artist in england is the only one to be fully reliable, and he has a day job and countless extra projects too. So i wil still be posting about my own personal dev for Sorcerygames (hence the blog title). But i will also be posting about 'The Midway' for PS3Home. That should be diverse enough for anyone really. Xbox360 <--->PS3. Should be entertaining i hope at the very least. The Boss tonight gave me permission to Blog about the work we have been doing the last several months. I will write more later, but suffice to say i am very excited about our product, and the push we hope to give PS3 Home. Below is a picture i grabbed from my dev machine with my female avatar wearing some of the Prizes i have been working on getting setup. I know the lighting is not great, but more to come as i try to blog about this over the next several weeks. 1. I have moved the debug text out of the main play area and to the bottom left corner. I also shrunk the font to some debug size 9 point font. 2. The score has now been placed in it's wide screen position. In fact all multiplayer scores are now sorted out. 3. There are gaps in my bullet paths this time. This is in fact the biggest change and the reason for this post. I have added in the firing delays i need for the firepowers. The forward and backward main fires are still full bore. But the angles ones have a delay timer, and the side pods have a bigger delay timer. This will make it so you cannot smply crush aliens along the way. It also makes it look more interesting if ya ask me. Oh noes, i am being attacked by an enemy ship. There is something very satisfying with having lots of bullets. That balance though of obscuring the screen and fulfilling firepower is a tough one to manage. What you see above is my attempt to get this balance right. The image is flawed of course because i have infinite bullets and they are coming out at infinite speed (ok, as fast as possible). This isn't acheivable by button bashing, but is with rapidfires etc. You also see some of my debugging numbers to tell me how much i am straining the system.. yeah straining an Xbox360, lol. So the point of this picture is really to show you that although i am going to allow a lot of bullets to leave your ship. You will still be vulnarable from the top and bottom areas. This is key in a side scrolling shooter, as that is the way you have to travel to get in front of the enemies so you can blast the living heck out of them. Simply put.. all the firepower in the world will do you no good unless it is hitting the enemy. You can also see the stars flying by in the background, so pretty. Or Dog and Pony shows. These are times of great excitement (i also hear trepidation from some developers). For me personally i love to show off all the hard work my team has put into the project they are working on. It is a proud moment when the employers see all our hard work and see how much we are over delivering. THQ are round today looking over our current PS3 Home project for them. We have only been on it for 3 weeks so far, but with the wonderful effort put in by my team, it looks great already. I am sure they will be bowled over by what we have. I still hope soon to have permission to post more about this project and put up some screenshots into this blog. Also our own Mass Media private Scene we have been working on for some time. That one will knock the socks off what is already out inside PS3 Home. Wish my luck on the permissions. I have an octagonal area for the UFC Undisputed PS3 Homespace. In this area i need to spawn balls that will fall from the sky (it's for a minigame of sorts). We are currently spwning the balls based upong the center and then a radius from that. Simple enough. But i was intrigued to know if there was a simply algorythm that could spawn the balls correctly in this shape. After all the shape is a nice one. so i put it out on Twitter to see if anyone had any ideas. so far i have had two great replies. always tot of an octagon as a square with 4 triangles lobbed off. filter out spawn point if in triangles? simple but not fast. Both great replies. I am not sure if we will do these as we have to write in LUA for PS3 Home, so it's not fast at all. I lurve me some big firepower upgrades. In fact i just love upgrades and who doesn't ? I like balance, i also like consistency. So if i just add a bullet shooting out of the top of the ship, it will look unbalanced and crap. But if i add two bullets, one ouot of the top and one out of the bottom, i have added just too much firepower for one single upgrade. BAH! My game willl have 25 levels, so i need to come up with 24 upgrades to your firepower. That is a LOT, and the more does not always make stuff merrier. It can in fact diminish playability and cause confusion. So i have to be careful. For now i have the first 10 levels of upgrades designed, and am trying hard to figure out what level 24s upgrade should be. That will be the final upgrade, so what should the ship loko like when it has total upgraded firepower. I think once i answer this, i can work out what to upgrade based on my nice level 10 setup and what i need for the final level. I might just swap around the center firepower upgrade with the going to trip firwpower. I think this will be a better progression, but i will test both at the right time. So back to the grind of figuring out what i want the final firepower to be i guess. These are the ships i have been working on. I have spent time trying hard to make each ship recognizable on it's own look, rather than just color. Though obviously i left the color component in as well. I have kept the most major of characteristics alive in each ship, but made them have what i think its a more distictive trait. So one feels 'fat' and one feels 'sharp' and then there is the middle ground original ship. Is this a way to go? I have not done the 4th ship yet, and i wonder if i am wasting my time, and i may need to make the ships completely different to really work for colorblind people. I would love any comments on this ship redesign, before i commit too much time to going the wrong way. So i have been working on my Ships and how just coloring them has not worked out to well for those colorblind players. In a previous post i mentioned this and thankfully got a lovely response. So i am dealing with this. I won't mention any more about the ship colors in this post, as that is another post with pictures. So what are we chatting about here ? How can that be an issue i hear you mumble. Well here i am working on the player ships when i realise the only connect each ship has to it's score in a 4 player game is the color of the score font. Ouch, this isn't likely to work too well. So what am i going to do about it ? Well i spent some time talking with Paul from Tallwaiters and came up with a few solutions. 1. When the ships spawn they appear directly under their score. 2. When ships spawn the scores movre from those ships and goto their normal screen placement. 3. A line draw is used to connect you ship to the score. 5. Add your Gamertag above your score. From that list i loved the idea of number 5, and easy to do. Idea 2 could be inetersting because i can time the appearance with sparkle effects and movement speeds etc, to make it more sequenced and look good. If anyone has an opinion, please let me know. I have had my aliens being spawned now for a while. In fact I rewrote it recently (2 weeks ago?). I wanted to make it simpler and more appropriate for this normal shooter. I did not need such an incredible spawning algorythm for this game. I need a robust system that has relatively few parameters in it. So aliens are spawning, and it is time to take control of their movement. For now i was just planting them on the screen then checking their type to do some elementary velocity movement. Some still retained code from Pellmell and so would follow you around a bit etc. Now it is time to get serious. This is after all a bit of a Homage to classc shooters of old, and they had nice waves of aliens following along after each other along predetermined paths. That is what i wanted. So i have created Alien Orders (AO). This little system is TIGHT. i love it when ya write a routine and it is not massive, but does so much great stuff. With it being tight like this, it will be so easy to add more functionality to is as it needs it. Here is my basic data layout with the header listed and the instrcutions i currently have them able to understand. Above I describe the instuctions i can Order an alien to carry out. Then i have some Defines to make stuff easier to read. Finally you see an example AO data set. This one moves an alien left nad then up and then repeasts, while ordering a shot between each change of direction. I also did a data stream for a few other interesting movements. One is a wave that makes the Aliens snake towards you. Pretty cool. Also if you combine this type of system with other controls, you can end up with a mighty powerful looking alien control. take for example if you have AO making your alien move in a square (box) move. Then supplement that with a homing routine. You would have a box moving alien coming towards you. Pretty neato. In conclusion, there is No reason to over think Alien control routines. I have seen some programmers sink because of their overly complex Alien control routines. Above is the picture of my Ship from my upcoming shooter 5th Moon. I havementioned it before in this blog and even shown various stages of it's graphics changing and developing etc. Now I was recently introduced to the problem of colorblindness in games. I wasn't aware of the main issues faced by this group of people. However i do sympathize. I do not know much about all the issues faced, and currently am aware of only an issue related to the colors Red and Green. They cannot be told apart. I feel this is an easy thing to be solved in any game for sure, but as most games have baddies colored red in some way (read name tags etc), and the good guys so often in green, it is obviously a big issue. Especially in a game like MW2. I only have a small game it's true. But i would love to address these kinds of issues as best as i am able. So for 5th Moon i realised that i am using the center of the players ships to indicate their health. This will be bad when i color them in various stages of health and they start green, and end in red. Hmm, a colorblind player will not nescessarily be able to tell if they have one hit left or three. So i am wondering right now what would be the best way to alter this Health spot to make it work for colorblind peeps. so far i have a couple of ideas, but no idea which would be better for them. 1. As the health decreases, i can shrink the color/health spot on the ship. 2. I could fill the color spot up with Black from the center, so it looks like it is diseased haha! 3. What else could I do ? If you have any ideas, please leave me a comment or email etc. I also have the above picture showing the colors i chose for my multiplayer ships. Are these colors AOK for colorblind people to see fast and easily? If you have an answer please let me know. I can of course change them, and would love to if this helps players out. It is really more like, trying to do basic looking C64 graphics. They look close, but don't quite match. I think it is because i am using too many color gradients. Bah! Anyway, above you can see my new alien. It is going to move in an odd pattern across the screen, but more importantly it will be firing 4 bullets at a time, and they will be fired and the for cardinal directions, north, south, east and west. As you can see, this alien makes sense for that. It is also a 4 frame animation, as i could not be bothered to mark it is a pong animation haha! so this simple alien looks quite good with it's sparky highlights moving up and down the diagonal poles. I am happy with it. So i talked with my boss today.And i hope that soon i can actally start talking about and revealing some of the amazing and exciting stuff i have been working on at work. All of it is for the PS3 Home enviropnment at the moment. we are pushing the boundaries of it though. It was also mentioned that Sony will be talking about our example at GDC, so that should be great. Fading stuff.. What kind of stuff i hear ya ask. Well anything really. One of those distinctive marks between a professional game and a quick amateur game is that nothing fades, or most things do. Some fades can be so fast they only have 1 single intermediate frame of half fade. Others can take ages to fade. Fading up or down, it does not matter. For impact you usually just pop stuff on the screen, but when it's time for that item to leave it is a bit abrupt to just remove it. Take a look at any game you love and see just how much stuff fades in and out (especially text). Then take a look at a lot of the stuff on Xblig and notice how it pops on and off. Popping on and off is an option, but it should be regarded as such. Writers should consider this type of thing as a design decision. Personally i love fading (oh i mentioned that already). I have not found a place to overuse it yet haha! So i just got through fading a few more things on my game, screens and text galore. The one i am most pleased with is the level name that overwrites the level at the start of each one. It popped off and it was ugly. Now it fade quite appropriately and at a nice pace, just in time for the level to start. wonderful. I find it is very complimentary to my 3 stage fading of the background and sprites and overlay Scoreline. so next time you have items coming on and off in your game, please think of the abruptness and fade. Here is the new lettering i created today for the logo. The most interesting aspects are that i had to create them chunky, as that was the way such things were back in the day on the C64. An oddity of the C64 was that it had double wide pixels. This made it chunky whether you wanted it to be or not. But it only had double wide, not double height. I emulated this when i drw this artwork. I think it came out aok for a rela first pass. I can always back later to tidy it up a bit. I also changed the 'Arcade mode' option to 'Single Player'. I did this after soem research was done by someone else from the XNA group. I will try to find some links and also put up some of my observations on his research soon. It was very good, thanks ClingermanGW. Five golden coins was sent off yesterday to various publishers. I sure hope that some of them , or one of them at least finds the book of great interest. We have sent it to 5 publishers that wanted a paper manuscript, and 2 that wanted electronic manuscript submission. We worked hard to get the cover letter written and the thing printed, man does it seem expensive to get color pages printed now, at 69 cents a page, yeeouch! Only when i tell em, and not before! I like it when things do as they are told. In this case it is to do with when aliens will spawn onto the lvel and try to kill ya. We need control, some very accurate and designed control in fact. This will be a much different system than the clever dynamic one i used in Pellmell. Even if noone appreciates it, it was a work of Genius. The fact it held up to all those levels and difficulties and variable speed of scrolling. ahh well. This one is simple, in fact it is about a simple as it can get. We have a time marker and associated with that we have an alien type. This pair will control the spawning of aliens once entered into a linear table. Once one alien has spawned, we will move the index up one notch and wait till the scroll gets to the time (time is really pixel distance along the level), and then spawn the correct alien. So simple a caveman could do it. However it took me a while in C# as i find the type sytax a bit odd. In C or C++ i would just use pointers and it would have been done in moments. here is the basic tables i used. As you can see i defined two simple arrays, Yes, i could have made it a Vector or a small class or typedef with the two elements in it, but it's all about being cheap and fast and cheerful, i just couldn't come up with anything simpler than this. Anyway above you can see that i list the simple int array with the spawn timings in it. Then i have a nice table that links to each of the level int arrays (once i make them). That means i am now able to index through the main table to the levels table and then offset that by an index to work through it. here is the access line for it. Now that is so simple i love it. So now i have a new spawning control. One anyone can use. I may do an editor, but i am not certain at this point. I may have mentioned a few times that i want my C64 lookalike shooter to, well, look like it os from a C64 era. Well one of those important features that make it feel right, is the title page. Namely the font used and of course the over enthusiastic use of sprites and movement and sometimes color on that title page. So above i have a picture of the important part of my title page. It has the name as sprites and they bounce quite happily across the screen in a sine wave pattern. You can also see the work i put into the font, and i went for a completly retro look with the grey. I have to say it works quite well, but at the moment i think i am missing something, probably that lovely C64 music stylin.. Might have a hard time doing something like that to be honest. I'll do my best. well here is the sales stats. Apparently we downloaded nearly 3Ks worth. Not quite the numbers that would have gotten me excited. Now 5K would have made me dizzy with excitement. But 3k.. hmm. Maybe it will have the preverbial long tail for downloads. I hope so. Aceball does and my otehr game Pellmell does not. So it will be inetersting to see where this falls. The low sell thru is completely expected, but i really wish i could have sold this for 1 dollar. I truly believ it would have had a conversion rate in the 20% range for that, wheras it is so low in this way. But hopefully i have introduced a whole load of people to this wonderful comic series, and now they can follow on Scotts Dreamland site. so lets think of the possibilities of it selling 20% at $1 each.. Just for yucks as it were. 578 is 20% of 2893.. So that is 578 dollars earned, and i get 70% which is 404 dollars to me! Which would have paid for the music and the press release, and given me some sandwich money.. Woohoo! 42 copies is 126 dollars earned, and i get 70% which is 88 dollars to me! Dang not enough to pay anything off. I sure hope MS lets me drop the price soon, though it is already too late for this product, i would bring out a sequel with more of the amazing story pages. Above I have anice image i took tonight from my latest game 5th Moon. 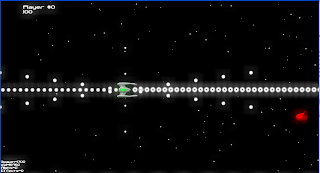 You can see the nice new ship i have previously blogged about, and you can also see it is firing bullets at the moment. Notice how those bullets are not quite aligned. Well it wasn't easy to tell what was going on until i took this screenshot. Woohoo! i now know what to do to fix the issue of it looking odd. The second issue is the fact that the middle bullet is obviously starting further back than the top or bottom pairings of bullets. So i will need to look into that as well, then i will have a lovely 5 way firing formation. The tip of this post is.. If something looks odd on screen, then screen grab it. Posted by VoodooChief at 11:21 PM 0 comments Fire from Where?